It's 'My Kind of Town' crooned Frank Sinatra - and we think you'll find Chicago is yours as well. This vibrant city has the perfect combination of old and new. You can see the city’s sky high views atop its iconic skyscrapers, discover the great performing arts on offer and take a trip to the Navy Pier. Yet it's a city that's big on tradition too, and that includes a passionate allegiance not only to its major sports teams, the Cubs and the Bears, but to deep-dish pizza and its unique style of hot dog. Chicago is somewhere that begs to be explored. Take a boat ride along Lake Michigan, there's a long stretch of shoreline to discover, including the spectacular public art of Millennium Park, Chicago’s finest beaches and Lincoln Park’s famously free zoo. But there are lots of other interesting neighbourhoods to poke around in too. 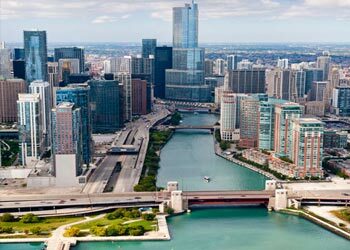 Downtown Chicago is where you will find some of the world’s best modern architecture and all the big city bustle; Wickcaer Park and Bucktown have a trendy off-beat vibe; and Old Town has historic buildings. Day and night there's a long list of things to do on holidays to Chicago, and hitting a few of the city's museums is a must. There's the best collection of Impressionist paintings in the country at the Art Institute of Chicago, while the kids will never forget seeing Sue, the largest T-Rex skeleton in existence, at the Field Museum. Or if shopping is more your thing, then head to the swanky shops of 'Magnificent Mile' or find yourself a one-off in the quirky boutiques further west. There's no stopping once the sun goes down, either. Chicago's restaurants serve up every type of cuisine imaginable, while there's a thriving bar scene, plenty of live sports, and a buzzing Theatre District including Broadway shows - not forgetting superb live blues and jazz in some iconic clubs. Forget 'My Kind of Town'; how about 'My Kind of Holiday'? Ride the elevator to the 103rd floor of the second-tallest building in the Western hemisphere for stupendous views across the city and Lake Michigan. For the very brave, the Willis Tower (formerly the Sears Tower) even has glass boxes, known as 'The Ledge', which extend out for over a metre from the side of the building. So man up, step out and look straight down - if you dare! 'Magnificent Mile' along Michigan Avenue is a Mecca for serious shoppers. It's home to a string of big names, including Bloomingdale's, Neiman Marcus, Nordstrom, Macy's and Sak's Fifth Avenue, as well as three big malls. For anything from fashion-forward to designer outlet shopping, try one of the Simon Shopping Destinations, and for independent boutiques, head for Wicker Park/Bucktown and the Lincoln Park area. There's stand-out architecture everywhere you look on holidays to Chicago, and taking a guided tour of the main sights is a must. This is the city that spawned the skyscraper, so there's plenty of interest to discover, as well as Miles van der Rohe's modernist Illinois Institute of Technology buildings, and Frank Lloyd Wright's home and studio. If you're after a good night out, holidays to Chicago can deliver. There's fantastic drama and Broadway hits at the city's string of theatres, and brilliant live comedy at Second City - the venue that kick-started the careers of Mike Myers and Tina Fey. Or if its live blues music you're after, head to clubs like Kingston Mines or B.L.U.E.S. Chicago comes alive with festivals in the summer. The Blues Festival (June 3-15) is free and attracts big names; the massive Taste of Chicago food festival takes over Grant Park from July 9-13; the Air and Water Show delivers spectacular aerobatics over Lake Michigan from August 16-17; and there are many others. Just two blocks east of the world-renown shopping, dining and entertainment lining Michigan Avenue, this appealing Chicago hotel provides comfortable accommodations in a great location. Where old world elegance blends with the modern amenities of today, this inspired hotel offers its guests an upscale oasis in the heart of sweet home Chicago. This lavish downtown retreat has achieved an unprecedented fusion of historic luxury and contemporary amenities. Located in the heart of Chicago's cultural core. Offering spectacular views of the Chicago River, Lake Michigan or the city skyline, this grand hotel is one of Chicago's superior riverfront destinations. Located within walking distance of Navy Pier. Blending old world elegance, personalised service and a great location, this hotel has been a Chicago landmark since 1920. Located on downtown Chicago’s picturesque Magnificent Mile. This intimate hotel provides excellent views of the city, Grant Park and Lake Michigan. With convenient access to Chicago’s Magnificent Mile, world-famous museums and sporting venues. The Tremont Chicago Hotel at Magnificent Mile is located just a few footsteps away from its namesake: the city's world famous one-mile stretch of Michigan Avenue. The Westin Michagan Avenue Chicago located on Chicago's famed Magnificent Mile, is steps from Lake Michigan, Michigan Avenue restaurants and premier Michigan Avenue shopping. in the middle of the famed Chicago Loop, W Chicago - City Center is close to the Sears Tower, the Chicago Art Institute, music at Millennium Park, and the theatre district. Combine the relaxed city pace of Chicago with the vibrant skyline of New York. Explore the sights, museums, galleries, fascinating architecture and lakefront beaches that only Chicago can offer. Afterwards, fly on to the Big Apple and take in Manhattan. Shop along Fifth Avenue, see the panoramic views atop the Empire State Building, the list goes on…! This action packed multi-centre combines the towering skyscrapers and shopping opportunities of Chicago, with the Blues and Rock ’n’ Roll atmosphere of Memphis, and rounded off with the sounds of Jazz and the tastes of Cajun cuisines in New Orleans. This music infused multi-centre of the USA will no doubt leave you tapping a beat to the sound of the blues. Located in the heart of the US, the Land of Lincoln promises a true American discovery, where mile after magnificent mile showcases the best that Illinois has to offer, jam packed with Presidential history, quaint towns, quirky Route 66 attractions, spectacular scenic byways and some of America’s popular sports. See the best of what Illinois offers on this classic fly drive, taking you through the state capital Springfield, to the river towns of Alton and Peoria, followed by the historic towns of Galena and Rockford. Take the iconic Route 66 drive from its starting point of Chicago, following the journey across the USA, stretching over 2,400 miles to its final point in Santa Monica, This legendary road needs to be driven at least once, whilst taking in a variety of pure Americana landscapes through some of the country’s biggest, oldest, iconic and most peculiar sites along the way. Discover the majestic wilderness of the Mississippi River on this fly drive through the heartland of the American Midwest. Once home to the Native American tribes, French explorers and river pirates, explore a land of charming river towns, historical landmarks, scenic vineyards set against the sweeping beauty of the Mississippi River. Take one of the great American train journeys and travel coast to coast across the country - all the way from New York to California. You'll ride aboard the California Zephyr, cross the Continental Divide and pass through some amazing landscapes from the Great Plains to the majestic Rocky Mountains. You'll also spend time in the stand-out cities along the route, with time to discover Chicago, Denver Salt Lake City and San Francisco. It's an American adventure you really shouldn't miss. What better way to experience Route 66, one of the most famous highways in the world, than by motorbike? This exciting motorcycle tour allows you to feel the wind in your hair as you ride 2,400 miles from Chicago to Santa Monica, crossing eight states and three time zones. Many of Route 66's classic restaurants, gas stations and quirky landmarks are preserved just as they were in the 1950s when thousands of cars rode bumper to bumper, all eager to experience the Western frontier. The best views can be yours at the John Hancock Observatory, take the exhilarating ride to the 94th floor where you will get a 360 degree view of what Chicago has to offer from only £10 per person. Cruise along Lake Michigan and take in the amazing views of the city’s famous sky scrapers from a great vantage on a 30 minute cruise from only £10 per person. Follow the path of the blues music genre and the famous Blues Brothers on a coach tour through the city, with interesting facts about the Blues Brothers phenomenon as you visit the famous locations from only £20 per person. Millennium Park is a very popular attraction for all the family including the Crown Fountain and the ‘Bean’ there are plenty of things to keep everyone entertained. Movie buff or not, you’ll see the best Chicago has to offer on a movie tour of the city. See dozens of great movie locations and popular blockbusters where they were filmed from just £20 per person. Taxis from O'Hare International Airport to city centre hotels start from $40 per way. Lakeshore Drive is great for strolling and try a Chicago Style hotdog along the way. If you’re visiting Chicago in the summer (between April and September), take in a Baseball game at one of Baseball’s most famous stadiums - Wrigley Field. For anyone travelling to the USA, the US authorities require passengers travelling under the Visa Waiver Programme (VWP) to register for an Electronic Travel Authority. Just fill in the online application form which you can find at https://esta.cbp.dhs.gov. You will need to apply for entry via ESTA a minimum of 72 hours prior to travel.